I APOLOGIZE! I REALLY DO I'M SORRY! Ok, I know... I know.. I'm a horrible person for not updating!! So sue me (don't really please.. I'm broke!). A lot has happened since I posted! For what you might ask? Well for 1: I graduated college! Yay me! For 2: I got a purdy new job! Double yay me! Alright, lets get to the cooking, you see the picture above and it's got you curious. You ask aloud: "BSH how can I too make a delicious fried potato creation?!? Please, share your amazing fried secrets!" This is the part of the show where Paula Deen would normally yell "MOREEEEE BUTTTERRRR!!!" But I don't eat butter and I use oil. Ok friends, family, readers and creepers; here's how you get started. That is it! Ready for this 'super complicated recipe!?" Well keep on reading! Step Two: Grab that grater and shred that tater on the size you prefer. Also grate a bit of onion into this and don't stop till you got nothing left! Also, watch those knuckles! Nobody like bloody, skin sprinkled hash browns! Step Three: Place the shredder potato in the cheese cloth, or 2 paper towels and SQUEEZE the living hell out of it! I mean, really! Squeeze till it is bone dry! Step Four: Heat a pan with a decent amount of oil till it is SUPER hot. Step Five: Placed that taters into the pan, and flatten out. Cook till golden and deliciously brown! There you have it folks! 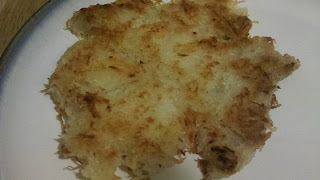 A simple, super easy, delicious hash brown recipe!